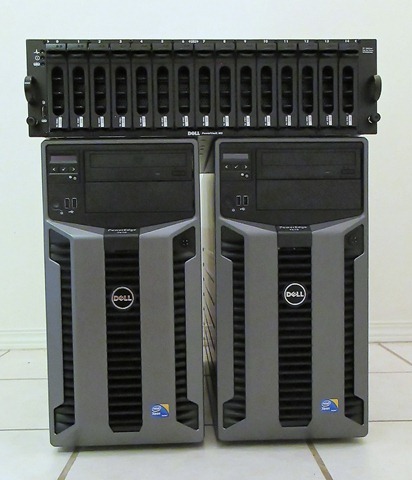 Before I start assembling the hardware and installing the operating system, I am first setting up an older Dell tower computer I have as a domain controller. In addition, I am configuring a wireless bridge to my wireless network, as the location of my test system is not located near a convenient network connection. Once I have the domain controller and wireless bridge configured and working, then I will begin assembling and configuring the new hardware. This entry was posted in Database Administration, Hardware. Bookmark the permalink. Nitin, the PowerVault MD3000 will become the shared data drive for the cluster, once it is configured. The MD3000 will be connected to each T610 via a HBA (host buss adapter).